Tours in English are every day at 14.30 from April to October and are on alternate days at 15.30 from November to March. Tours in other languages are on specific days. La Scala Museum and Theatre Tour departs every afternoon. We are comparing La Scala Theater and Milan Museum Tour Prices from leading ticket suppliers and Try to find you Cheap tickets prices on the market. Artists, historians, performers and theatregoers will certainly enjoy this short but sweet 60-minute tour of La Scala Museum. Adults and children alike will become enthralled in the magic of performance as your museum guide takes you on a journey through the La Scala's history as a world-renowned Opera Theatre. During the tour you'll get a close look at costumes, furniture, statues and instruments dating back to the 18th century. But, that's not all, you can also see the decorative busts of some of the most renowned artists of their day. within the collections are famous names such as Toscanini, Puccini, Rossini and Verdi. Learn about the lives and careers of influential composers who have performed on La Scala's stage. Hear the facts and fables associated with the theatre itself. Before leaving you'll have the chance to set your own eyes the famous stage itself from one of the theatre's private boxes. If you interested in the arts or simply love going to the theatre then this is the right tour for you. The tour will fill you in on the history of performance in Milan and teach you about famous names in music. Your Experience With La Scala Theater and Milan Museum Tour? Take a 60-minute tour of La Scala Museum with a professional bilingual guide. 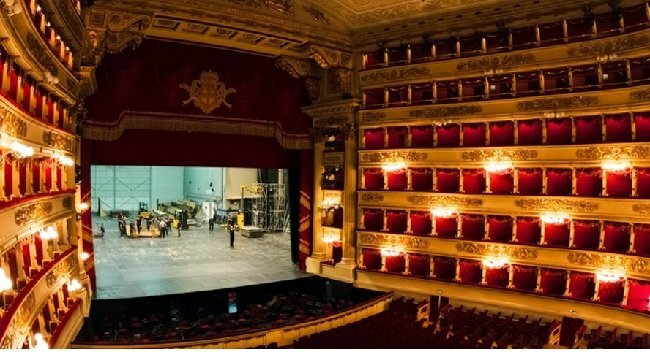 Then, get a sneak peek at the luxurious La Scala Theatre from the gold trimmed boxes. Learn about the many actors, singers, dancers and musicians who have performed before international audiences on this prestigious stage. See a remarkable collection of genuine theatre costumes, set pieces, statues, paintings and more. Listen to the antique stories and facts about this magnificent theatre. What La Scala Theater and Milan Museum Tour Includes? 60 minute guided tour of La Scala Theatre and Museum. Expert English, Italian, French, Spanish, Portuguese or German speaking guide. Travelers Reviews about La Scala Theater and Milan Museum Tour? This 1-hour tour has a 3.8-star rating on Get Your Guide users. It has slightly higher average scores of 4 out of 5 on Viator and TripAdvisor. Despite having below 5-star average scores this tour does have a lot of positive feedback from travellers. Comments agree that the tour guides speak excellent English and are knowledgeable as well as funny. Most will agree that the theatre tour is worth the money. Tickets from some tour providers are fully refundable if cancellation is made at least 5 days in advance. If rehearsals or shows are in process it may not be possible to view the theatre.